There are different kinds of conversion kits. Not all conversion kits are going to fit any bicycle, so before buying any kit, make sure it fit to your bike! Make sure you have a suitable frame. Installing a front hub motor on a bike only with a steel fork since an alloy fork may not be able to handle the torque produced by a hub motor. 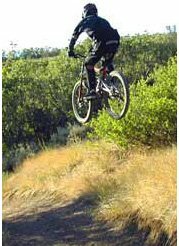 An alloy fork is likely to crack creating unsafe riding conditions. You can check for the material of the from in the specification catalog your bike. But even more easy, you can try to attach a magnet to your bicycle's fork. If the magnet isn't attracted, your bicycle probably has an alloy fork. Many front hub motors can easily tear off an alloy fork and cause injury. Some kits might be OK but it's a real risk. In such a case, it's recommended to either consider buying other kind of motor configuration and if you really want a front hub motor, you can consider replacing the front fork. Make sure you have enough space between the fork (rear or front - depending on your kit) to attach the new motor. Make sure you have a nice and suitable place to put the battery and the controller. Make sure the motor is compatible with the "V", "U" or disk brakes, whatever you already has on your bicycle. Be sure that your bicycle fit the purpose. Is it in good condition (not too old, not in too much bad condition, etc), Is it really the kind of bicycle that you would consider to buy as your new e-bike if you wouldn't already have it?Despite all this, it is not uncommon that some things don’t quite fit together, and making some compromises and thinking is oftentimes necessary.